This week, our hosts Kristine D’Arbelles and Julia Kent welcome on the show for the second episode in the row - Ross Simmonds. Ross is a communications and marketing strategist and entrepreneur. You might know him as @theCoolestCool on Twitter. Ross has agreed to join us from Halifax as a superb guest host to help bring new views and opinions to the show. 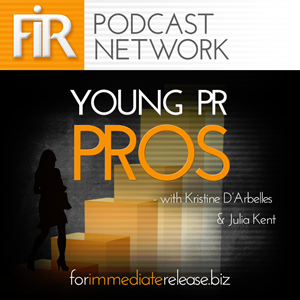 For episode 101, we discuss the best PR and communications campaigns. A few weeks ago, our host and roving reporter Kristine attended the University of Ottawa Public Relations Association (uOPRA) conference Connect 2 Success. The one-day conference brought together professionals from all industries of PR and communications to talk about what young professionals need to be successful in their future careers. At the conference she interviewed speakers, experts and panelists and asked them to share the best PR or communications campaign that has resonated with them throughout their careers. You can find video footage of all the interviews mentioned in this episode on our website, or on our YouTube channel. What is the best PR or communications campaign you think should be added to our list?